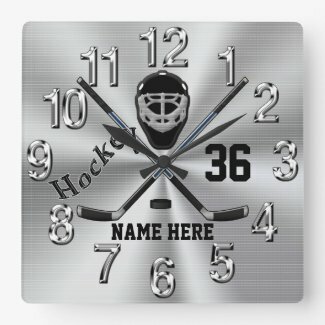 Personalized Hockey Wall Clock to help keep your hockey player on time. Big silvery numbers against burnished silver like background and cool hockey designs with his NAME, Jersey NUMBER or MONOGRAM. YOUR TEXT, your way. You can also delete or add text. CALL Linda to make color or design changes at no extra cost. Linda: 239-949-9090. Super cool burnished silver look bursting background with Hockey Sticks, Hockey Puck and Hockey Mask. Change “Hockey Rules” to YOUR TEXT or delete it. Nice Addition to your hockey wall decor. ANY COLOR Background and Customizable TEXT. I included instructions in the Design Description area on each product page with how to change COLORS. Call me and I will make the changes for you or explain on the phone how you can change it online. Hockey Bedding Accessories will transform your regular boys bedroom into a super cool Hockey Bedroom in ANY COLOR, literally. You, or call Linda, can change the background and custom text colors to any colors. Choose from standard color boxes to using Zazzle’s great color slide tool to adding your own Color Code. It is amazing to watch it transform before your eyes. Hockey Fleece Blanket in Small, Medium and Large sizes. I can also create a woven hockey throw blanket for you to coordinate or match (colors may vary on different materials). I can even create hockey fabric by the yard in any colors in many fabric choices for a really cool hockey bedroom for boys and men. 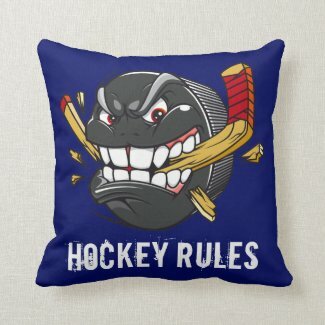 Hockey Sticks and Hockey Puck Pillow and other Funny Hockey gifts for kids. Type in their Name and Jersey Number or Monogram (for those whose jersey numbers change) on the back too. 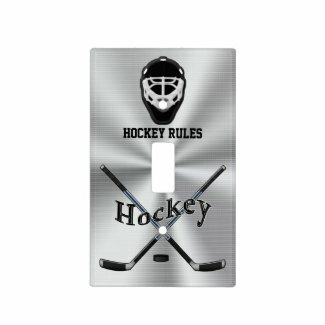 If you need help making the changes to any of our personalized hockey bedroom decor and hockey gifts, please call Linda: 239-949-9090. These very simple hockey bedroom decorating ideas will make it so easy to transform any room into a custom hockey room. It is even more special because it is personalized hockey decor just for them. Feel free to call me to make Color and Hockey Design changes for you. No extra charges for custom designs. 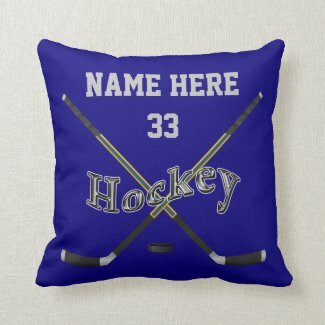 I will email you a preview image before you decide to purchase any custom hockey gift (really any Zazzle gift). 100% guarantee to Love it or you can return it. Click on the tiny hockey gift still WITHIN your CART to Go Back and Personalize the next personalized hockey gifts for players. This saves all the changes you just made so all you need to do is change the players names and numbers, etc. It will save your Team Name and Hockey Design Colors that you just changed. It is easy for me to explain how to do this on the phone if you need help. 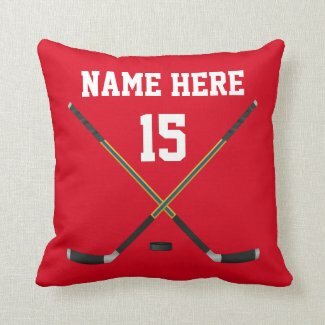 I will be happy to create new and fun hockey gifts for you. CLICK the following Hockey Stuff image to see ALL of our cool Hockey Gifts for Players and Coaches and Hockey Fans. What are the NHL Ice Hockey Rink Dimensions? The official size of a hockey rink is 200 feet by 85 feet. Not all professional NHL hockey rinks are the same. The corners which are rounded off have a twenty eight foot radius. The fiberglass or wood boards are at least forty inches tall and forty eight inches or less higher than the ice. The rounded corners will have a radius of 28 feet. They keep the boards white except for areas that are authorized by the hockey league. They might include business advertisements or the ice advertising. There is a yellow kick plate that surrounds the full length of the boards. CLICK on the Tiger to Shop All of Little Linda Pinda Designs and Gifts from my Personalized Gifts Shop by Zazzle. Little Linda Pinda, LLC Independent Silver Pro Designer with Zazzle Personalizable Gifts.